Would you like to learn to row, both indoors and on the water? We hold regular learn to row courses so please contact us for more information. ​We are recruiting new members for both our women's and men's squads and you don't need to be 182cm/six feet tall to row for us. ​If you are aged 17 or over and want to race competitively for your local club we want to hear from you. If you have rowed or sculled before click here and join us on our training nights, while if you are completely new to the sport click here to join one of our learn to row course. This year the south coast championships will be held at Dartmouth on the 14th September 2019. This is where all the crews get together and compete for the championship cup. Please come along and support your local club and watch our fabulous crews race all day. ​We are located at Splash Point, Marine Parade (not the Splash Point leisure centre), just a 5 minute stroll east of the Pier in Central Worthing. Club nights take place on Tuesdays and Thursdays from 6.15pm onward with crew nights on Mondays and Thursdays. Training also takes place in the mornings at the weekend if we are not at a competition somewhere else. The Junior section, for those aged 16 and under, meets on Tuesdays and Thursdays between 4.45 and 6.15. We cater for competitive rowers, experienced or completely new to the sport. Although we predominately race on the coast, we also own river boats and both race and train on the river during the winter. We are members of the Coast ARA (CARA), the Hants & Dorset ARA (H&D ARA) as well as British Rowing (BR). Through the year, we race at regattas along the South Coast from Herne Bay to Swanage, as well as in-land on the river. 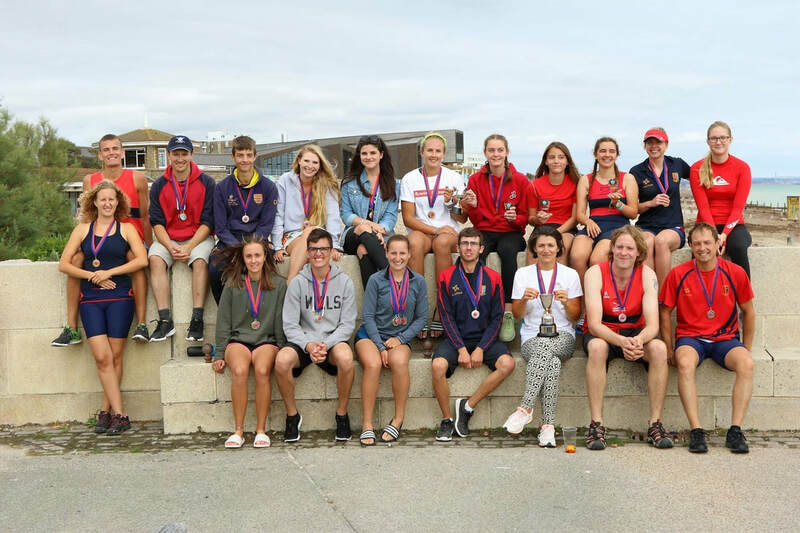 The last regatta of the season is usually the South Coast Championships where all the clubs from the Coast ARA, H&D ARA and the West of England ARA meet.